Driving back from Robin Hoods Bay to Keswick seems to take forever, and it is then that you really realise how far it actually is to race from Whitehaven in the West to Robin Hoods Bay in the East. It allows for plenty of time for reflection on the journey that we had just undertaken over the previous 4 days, the good bits, the bad bits, and where you could have done better. 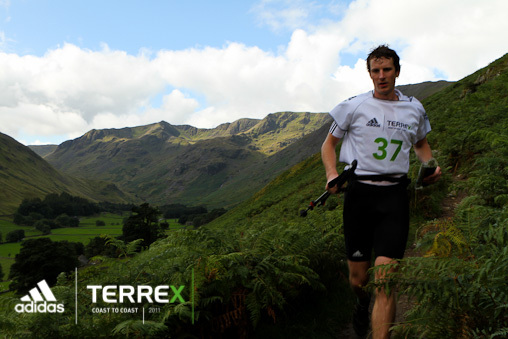 This year I was racing as a team, back for another go at the C2C route, racing with my long term team mate Nicola MacLeod, and also with James Cracknell, who in his new life as an adventurer wanted to give a multiday stage race a go. 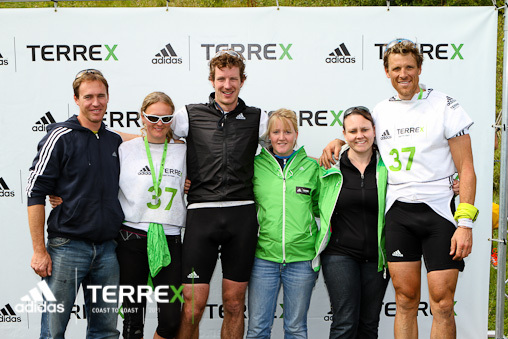 The race had been fast and tough with the times being almost 3 hours faster than 2 years ago. I’m not sure how everyone was racing so quickly compared to last time, the route was the same, the first stage was even longer this year, and still we all went quicker. So back to the start. The weather was kind enough to allow us to complete the sea kayak leg from Whitehaven to St Bees. This made for a spectacular sight, all the teams and solos racing out of the harbour at full pace, and then down along the sea cliffs. The paddle was great, maybe a little too benign for us as a team to make a significant inroad into other teams, but anyhow, we were the first team out of the water, landing not overly gracefully on the pebbles, before lumping the kayak up the beach. A quick transition (good work support team! ), we flew out onto the open road heading towards the Lakeland fells. Hitting the tarmac on the bike was my first experience for riding with James. I was out of breath from the kayak and had to really keep on it to navigate and keep onto James’ back wheel as we sped along the cycle way towards Kirkland and Loweswater. Coming around one corner a dog moved into the path, and whilst James’ managed to miss the dog, he hit some wet grass and wiped out onto the path, a nasty bang and almost had Andy Mitchell riding over the top of him. Nic and James paddled well, and arrived very quickly at the end of Buttermere, where we began to do some serious climbing on foot, up to the top of Robinson. It was a tough climb, and trying to haul 90+kgs up a hill isn’t easy. As we climbed steadily up the hill, Dan and Mat Halliday caught us up, and sadly they made it look easy, skipping up like mountain goats! We clung on to the top, but as soon as we begun to descend they flew away from us. James has never done any fell running, and I suddenly realised how much I took it for granted running down a hill. I, and most of the other competitors, have been doing it for years and it is just second nature, but for someone who has never done it, it clearly is a very practiced skill, especially at the speed we wanted to travel. The run from Buttermere over Robinson, Dalehead, Maiden Moor and Catbells is a long one, and with lots of up and down it is tough on the legs. The final flat run to Nichol End doesn’t hold much reprieve, before a cold swim across Derwent Water. The swim was good to start with but then my legs started to cramp a little. Trying to get my shoes on at the other side both James and myself suffered bad cramps, but soon managed to run them off as we chased Ant Emmet down before crossing the line on day 1, after almost 5 ½ hours of racing. Having my Dad live just outside Keswick was very useful, so we all piled home and had showers before sorting all our kit for day 2. We ate, we drank (water), and slept in a real bed; it makes a huge difference compared to sleeping in a tent. Day 2 started with a fast cycle to Thirlmere. The climb up Chestnut Hill out of Keswick seems to be relentless, and with little warm up it really hits home. However, once over the top you fly down to the end of the reservoir along the dam looking at the calm water stretching away down the valley. Nicola was all set to go, and James jumped off the bike, quickly changed shoes and was off. 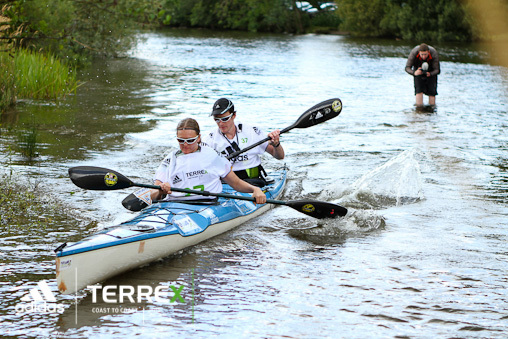 The water was like a mirror, and as we drove along the side of the water we cheered on all the other racers paddling. As soon as James was out of the kayak and had his trail shoes on we were away up and over Helvellyn. We knew we had gone well over the first few stages, so had time on Accelerate (the Halliday boys). We wanted to make sure we kept ahead of them for as long as possible on the hill, and we managed to make it to the top only overtaking teams, rather than anyone passing us. It was misty and cloudy on the top, and some teams struggled to find the way down. As soon as we began to descend James struggled a bit, and very quickly people began to come past us, building the frustration in James’ head as these mountain goats flew down the steep rocky edge and path towards Red Tarn and beyond to Patterdale. Reaching the sunshine in Patterdale, I swiftly got my kayak kit on and set off down the river. The one upside from coming down the hill a little slower was that Nicola could see how the other teams went down the shallow river section. Due to this we didn’t have to get out at all, and powered down the length of Ullswater; again in benign conditions, meaning we couldn’t take advantage of our superior kayaking skills. We had hoped to pull back Accelerate, but hadn’t seen them on the water, so we needed a slick transition at Pooley Bridge. With plenty of cheering going on I changed as fast as I could and began to head out of transition. Then all of a sudden Maz was running alongside me shouting ‘BIB’ at me. I soon realised I’d forgotten to put it on, so quickly donned it and caught up with James. It’s a tough climb up from Pooley Bridge, over the nose of High Street then onto the tarmac to Kirkby Stephen. It was heads down and pedal hard, eating the hills up as they came. 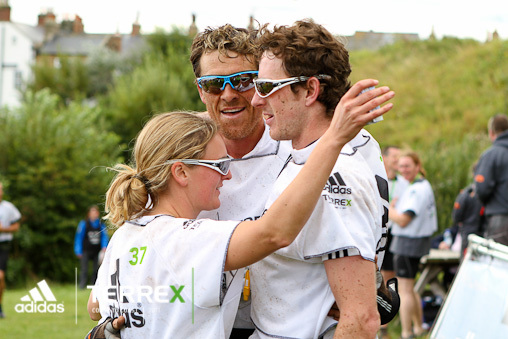 I fell off the back of James’ wheel at one point, and my legs were really tired, so getting back was hard work, so as I dug as deep as possible to pull him back in I had to think of the time we were taking back from the other teams to help drive me forwards. On the final big downhill towards Kirkby Stephen I lost the map, and had to rely on map memory and road signs to get to the town. Luckily I remembered the route from last time and we made it to the finish with no problems. It had been a hard day again, losing too much time to Accelerate on the mountain section, and not taken enough back on the other stages. On paper, we had won 4 out of the 5 sections, but had lost so much time on the other that it hardly seemed like the other sections made any difference. After another evening of relaxing, refuelling, socialising, it was off to the tent for a good nights sleep. We had got all our kit sorted for the next day already, so in the morning we only had to get up into running kit. Nine Standards Rigg is a line of cairns sat atop of an escarpment, the date of their construction is unknown, but they are seen on 18th Century maps. The run to the top is of the gradient where you can just run all of it. Walking is out of the question, especially when people start running past you. Over the top the fell is very flat, and incredibly boggy. 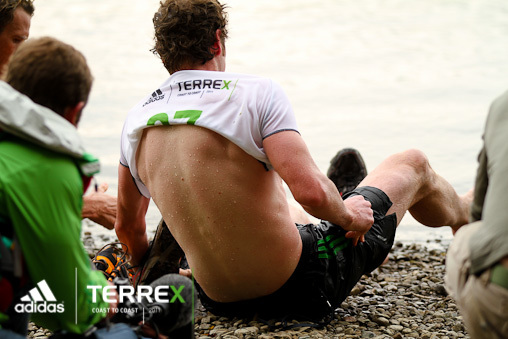 James had been struggling on the steep rocky descents, so I thought this one would be ok, gentle and soft underfoot for his London feet! However again, this was another time I’d taken running on this type of terrain for granted. James struggled again, and there was nothing I could do to help, but keep pushing on, trying to keep the speed up where we could, and prepare for the transition as much as possible. This meant almost stripping off to get ready to put bike kit on, taking the tracker out of the pack and into my bib shorts, and eating as much as I could before I got to the transition at Keld. Jumping onto the mountain bike after a speedy transition was great. The ride is brilliant fun, some steep climbs but great rocky descents, and Nicola and I had huge smiles on our face all the way along the route. The final drop to Castle Bolton is a grassy bumpy track, and Nicola on her full suspension bike was really enjoying herself as we rode past loads of water bottles that had been shaken off people’s bikes. A wheel change was needed in Castle Bolton, from my off road wheels to road wheels for the 50km road ride across the Vale of York to Northallerton. After a steep climb up from Castle Bolton the ride was pretty flat all the way to the finish line. I was in a tuck position sat behind James once again. 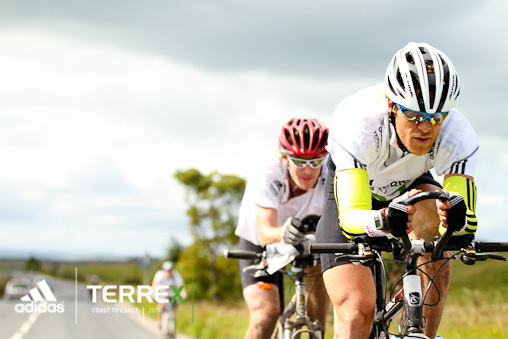 We were flying along, zooming past other competitors; James was taking his frustration of his running out on the road ride and boy could I feel it! At one point we were clocked at 35mph on the flats. Day 3 had been a tough one for us, losing a lot of time on the hill, and the cycling sections not long enough for us to make a real impact on the deficit. The afternoon was spent refuelling in Bettys Tea Room followed by a curry, getting set for the final day to Robin Hoods Bay. A short road ride to Swainby got the legs and lungs going, and with a 23second transition I was off running with Nicola up and over the Cleveland way to Clay Bank. Nicola had pretty fresh legs so was moving very swiftly up along the Carlton Bank, and we past Ant Emmet quickly, but couldn’t catch Kim Collinson who was on a mission on the final 2 days, and took the King of the Mountains title on this day too. Dropping down the bottom of Clay Bank I was directed around the transition area by our fantastic support crew, and was out on my bike before I even knew it. James and I then had to climb all the way back on the road to the top of Clay Bank, then a short hike-a-bike to the plateau of the Cleveland Hills. This was James’ first mountain bike test, and he was flying along on the climbs and the disused railway line, before hitting some muddy sections of short bridleway sections connecting tarmac. The final bridleway section was quite rocky, and James got a pinch flat, (very annoying! ), but we changed it in less than 2 minutes. Sadly this was enough for the Accelerate boys to overtake us. We jumped back on the bikes, and chased after them, zooming down the gravel track to Glaisdale. We caught them at the bottom, and both teams flew into the transition at the same time; the bit between our teeth, wanting to keep racing. A double wheel change was done in just over a minute. 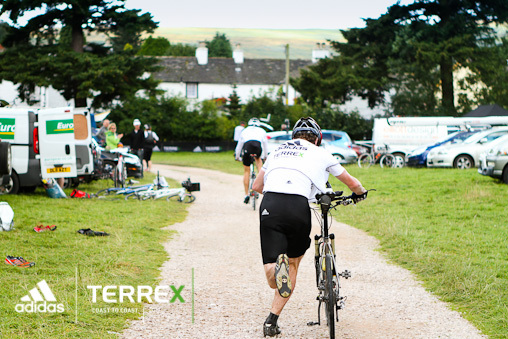 I wasn’t keen on setting off as I knew that straight out of transition was the steepest hill of the entire race. Leaving at the same time as Accelerate gave us the added boost to get up the hill, and we never looked back, pushing on hard when on the flat. Stu Lynch stuck with us well, and when we hit the short off road track he came flying past on his off road wheels. After a short bit of tricky navigation we reached the railway path, and followed this all the way to Robin Hoods Bay, dropping the bikes in a field, donning trainers and running the final 400m to the finish line just above the East coast. It had been a tough 4 days, sadly we’d not been able to match Accelerate on the hill running stages, and because of that they’d simply run away with the win, so hats off to Dan and Mat for being so swift on foot. It had been great racing with James, someone of such notoriety and an impressive athletic background, to show him my sport, and to work with him to get the best result possible. 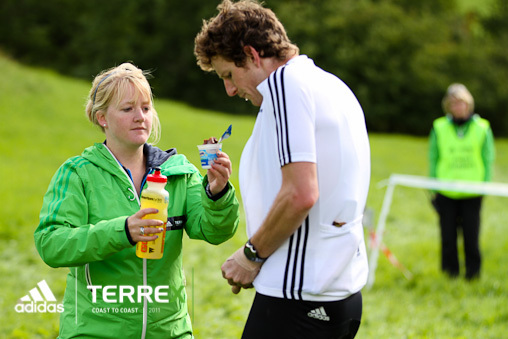 Nicola had been very strong in the kayak, on the mountain bike and on the foot leg. We had a fantastic support team, Emma, Willow, Maz and Tony (my dad) had been great, with super smooth transitions and never missing a beat, looking after us morning and night and keeping us fully fuelled up, thank you. 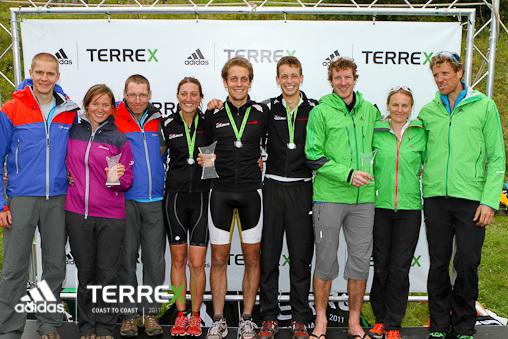 We had some great kit for the race as well, our adidasTERREX clothing was fantastic, and kept us warm/cool/dry all the time, as well as the trail shoes providing excellent grip when on foot. The adidas Evil Eye glasses also provided perfect protection from the sun and the flying mud when on bike, foot, and kayak.